These two topics are covered in more detail in later tutorials on prescribing in renal disease and in liver disease. 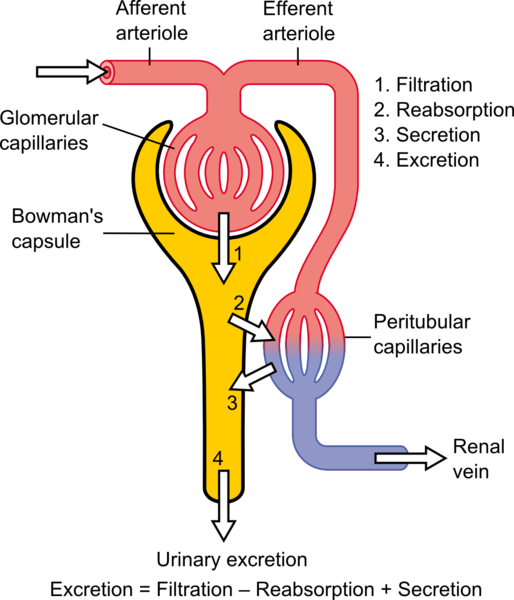 Three processes determine the amount of drug cleared by the kidneys: glomerular filtration, active tubular secretion and passive tubular reabsorption. The average glomerular filtration rate in young adults is 80 to 120 ml/min and approximates to creatinine clearance. Only unbound drugs are able to pass into the glomeruli: drugs bound to plasma proteins are not filtered. Although the glomeruli filter about 120ml of blood per minute, most is reabsorbed, resulting in 1-2 ml of urine being produced per minute. This leads to a drug concentration gradient between the tubular fluid and the blood. If the drug is physically able to travel back across the tubular membrane down the concentration gradient, it will diffuse back to the blood. The physical characteristics of the drug and the size of the concentration gradient determine how much drug is reabsorbed. The major organ of drug metabolism is the liver. Traditionally, drug metabolism is characterised as phase I reactions that oxidise drug molecules, or phase II reactions that link drug molecules to soluble compounds (e.g. glucuronides). In either case the resulting metabolite is more water-soluble than the parent drug and is more likely to be eliminated in the urine as described above. 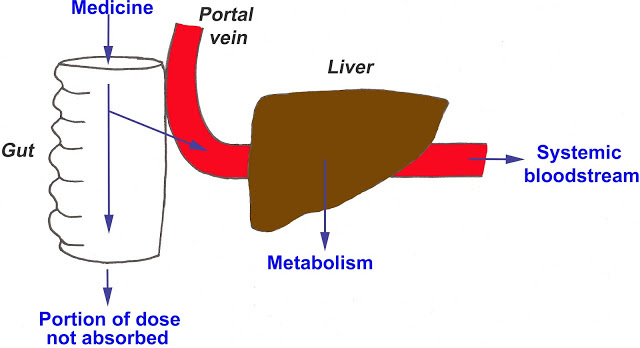 The extent to which a drug is metabolised by the liver during its first passage through the portal blood vessels after absorption from the gut is called ‘first-pass metabolism’. For example, glyceryl trinitrate cannot be administered orally because first-pass clearance removes 99% of the dose. When administered sublingually, the drug is absorbed directly into the systemic circulation thereby avoiding the first-pass effect. The ‘extraction ratio’ of a drug, which is related to its first-pass clearance, is defined as ‘the fraction of drug entering the liver which is irreversibly extracted from the blood during one pass through the liver’. The ratio can range from zero (no drug is removed by the liver) to one (all the drug entering the liver is removed in one pass). The hepatic blood flow via the portal vein is an important factor in determining how much drug the liver removes. Some drugs are wholly or partly excreted directly by the liver in bile (e.g. rifampicin).